The old Amber Road is historical artifact with reborn contemporary significant. eRegion denotes Information and Communication Technology (ICT)-supported initiatives that transcend traditional borders and boundaries. Re-establishment of business and government relations on the nodes of the New Amber Road towards creation of eAmber Road presents both challenges and opportunities. E-commerce: enhancing initiatives that facilitate the development of the e-commerce sector. Mapping digital agenda in the V4. Fragmented digital agenda in the V4 countries: how to go regional? Political State of the Region Report 2014. 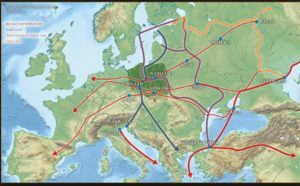 Baltic Sea Neighbourhoods – A Mega-Region in Progress?